Welcome to The Prairie Flower - Beautify Your World! The Prairie Flower, LLC, is a native seed and plant nursery and dealer in rural northwest Iowa. We are owned and operated by a farm couple and an ecologist, working on a square mile of sand, gravel, farmland, native prairie, wetlands, and the Little Sioux River. We provide local ecotype native prairie and wetland plants and seeds, as well as native cultivar seed, pasture and hay seed, and lawn grass mixes. Our services include tree planting, seeding, ecological consulting and planning, natural land management and landscaping. Points of Interest - Here! and Look into our Prairie Playday Offer - Here! and follow us through the seasons! 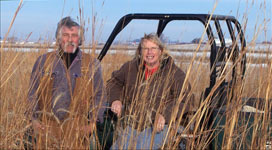 Owners Dwight and Bev Rutter on their prairie.